ogr2ogr -where "description LIKE '%chair_lift%'" -f KML chair_lifts.kml output.kml "aerialway_line"
See that LIKE? It’s in there because the KML has no database. I’m basically searching the description bubble and finding something. I felt pretty dirty after resorting to that hack. Of course you COULD create a KML that had more “fields” but those are few and far between. It might be my database background, but I almost require a database backend for me to actually use spatial files. So how do I interchange GIS? Shapefile - No, I already said I’m leaving. WKT - in an alternate timeline we are happy and this is our interchange format. I could go on, but you get the point. GIS formats are either poor choices from a technological standpoint or they are poorly supported. I’ve joked around quite a bit about SpatiaLite being poorly supported, but maybe it is time for me to get back on that wagon. Consider this my goal for 2013, use SpatiaLite as my personal GIS file format of choice. 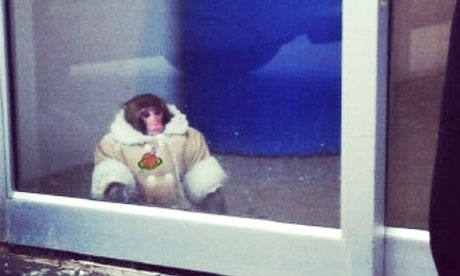 The GeoMonkey is wearing his SpatiaLite jacket waiting for the bandwagon to show up.